We are now two weeks into a season of the church called Epiphany. Having grown up in a different Christian tradition, I admit that the meaning of this period of the church year alluded me for quite some time. When I first came to the Episcopal Church, I had never heard of Epiphany. Like being a postulant and novice in a monastery, becoming acclimated to the richness of a new tradition can take some time. We learn by entering into the life slowly, absorbing little by little all that tradition has to teach us. There usually comes a moment when the nature and purpose of a particular practice will become apparent and make us exclaim: “Eureka! I got it!” While an epiphany seems like a sudden and random event, the truth is epiphanies happen after a significant period of time when a final tidbit of information gathered brings something into focus. While the ‘Eureka effect,’ (the sudden elation one experiences when having an epiphany) makes this event appear to be random, in actuality it is the end of a long process. Epiphany (from the Greek) literally means manifestation. Br. Keith Nelson reveals through his own experience how reading and praying with John’s Gospel can allow each of us to see the ordinary, challenging, and even painful events of our lives as signs imbued with meaning. He came to center our senses in himself. In his work On the Incarnation, the church father Athanasius wrote these words about Jesus, to describe one aspect of his cosmic purpose and mission: “He came to center our senses in himself.” It’s a simple and memorable phrase, with a pleasing, rhythmic consonance in English. I first encountered it in a library in my mid-twenties, while writing a paper for a graduate course. At first, it was simply the bright, felicitous thread that connected many conceptual beads into a strand that hung together. But I walked around repeating it over and over. I couldn’t get it out of my head. Nor did I want to. My fingers caressed the beads, as it were, and the thread held. It held much more than I imagined. The words haunted me for days and whispered me to sleep at night. Whatever was happening, this was not about the theology that I thought I knew. God (?!) was apparently happening to me, and in the smoldering depths of my heart. Behold what you are; may we become what we receive. I think my mouth literally fell open. It sounds so painfully earnest to put it this way, but Jesus Christ changed my life that day. In those tumultuous early days of my adult reconversion, I showed all the symptoms of a lovesick man. I cried for seemingly no reason, other than the inexplicable gratitude and subtle grace that seemed to lead me through each hour. I found myself gazing at anything and everything with a thirsty wonder, drinking in the miracle of its simple being. And I did something I hadn’t done since childhood: I read the Gospel. Over and over and over. I slept with my Bible under my pillow. Not since those childhood summers spent in Vacation Bible School at Hunter Street Baptist Church (Hoover, Alabama) had I spent so much time poring over the Word. Only this time, it really spoke. He really spoke: in me, to me, through me, around me. And the words that spoke to me with the most bewildering clarity and burned with the most intuitive truth were those from the Gospel of John. My journey of faith has mellowed and matured since those earliest days of conscious re-connection with Jesus. But the Gospel of John remains at the center of our relationship. As a member of a monastic community with a singular devotion to this Gospel, it suffuses my daily, lived experience as a follower of Jesus. But it also breaks into – erupts into – the daily, as sparks of new inspiration find tinder and crackle to Life. Monastics throughout the centuries have heartily commended reading and praying with John’s gospel as a sure path to intimacy with God in Jesus. They have found in its pages a central source of inspiration in seeking and discovering a life of mystical union with Christ, realizing by way of their monastic call the birthright of all Christians by our baptism. There is something more deeply, instinctually, intuitively transformative about John the longer I travel this monastic way. Why is this so? At its heart, monastic life is just the ordinary Christian life lived within a very particular frame, according to a distinctive rhythm, and under vows. But that frame, that rhythm, and those vows are designed to saturate the monastic mind, heart, and will with the Life and Light of Christ, to the degree that something extraordinary begins to suffuse and transfigure the ordinary. Everyday occurrences, objects, and interactions speak a living Word that, over time, become the nouns and verbs of a language. Likewise, at the heart of John’s gospel we find Jesus continually stepping into similarly ordinary interactions and handling ordinary objects, but in doing so, transforming them into signs that reveal the truth of who Jesus is and who we are becoming in him. The powerful, experiential truth I glimpsed in my first encounter with SSJE – through participation in the Eucharist – was a moment of glory revealed by a sign in this Johannine sense. Everyday occurrences, objects, and interactions speak a living Word that, over time, become the nouns and verbs of a language. In John, we are initiated into a wondrous Life of being-and-becoming along with the disciples by means of the signs Jesus performs. The Johannine community developed such a sensitive receptivity to the significance of Jesus’ words and actions, gestures and relationships, that they would never experience the world he redeemed the same way again. They became sign-readers, utterly convinced that “life is full of meaning in union with God.”2 In John’s prologue, we hear whispers of Christ’s cosmic role: “All things came into being through him, and without him not one thing came into being. What has come into being in him was life, and the life was the light of all people” (Jn 1:3-4). This suggests that meaning is literally hidden in plain sight, and that Life and Light are never far beneath the surface of things. This is part of what makes John’s gospel an especially illuminating path toward seeing Jesus and seeing ourselves as we read and pray with the Fourth Gospel. John wants to give us the Rosetta Stone to decipher that divine language, to make us light-bearers and life-revealers in a world hungry for meaning and thirsty for grace. In order to plumb the Johannine meaning of the word “signs” at greater depth, it will help to explore some scriptural scholarship here. Bear with me, the lens I’m looking through may feel clunky, but I think it helps us to see the stunning, three-dimensional relevance of Johannine signs in a whole new way. And Jesus is a Symbol who saves by generating symbols of himself. When Jesus unexpectedly turns water to wine at a wedding banquet or heals a man born blind, he is, on the level of reality that we can see and touch, enacting what we might initially call a “miracle.” But while the sudden surprise and wonder these semeia evoke is significant, it cannot be the bedrock of a mature faith, and the eye of the believer must gaze more intently. Mature faith for John continues to receive and interpret the semeia at deeper levels of fullness, through times of both joy and challenge. In signs, over time, we catch a glimpse of not only a miraculous thing happening in front of us, but also one happening within us, as our selves are transformed in ways more miraculous than mere water into wine. This journey through signs is unique to John’s gospel, and it’s part of what makes this gospel so rich for aiding in the transformative inner work of the Christian life. The reality of God – mediated to us by the “symbols” that flow from Christ and the “Symbol” that is Christ – breaks in upon the contours of ordinary Christian life as we read and pray with this gospel. Together, we grow in our capacity to discern these transfiguring signs in the details of everyday discipleship. The glorified and risen Christ continues to work these signs in you and me: “if every one of them were written down, I suppose that the world itself could not contain the books that would be written” (Jn 21:25). What close encounters with God’s gracious signs have interrupted your own journey, shown you something new about Jesus, and shown you yourself in a new light? Jesus is a Symbol who saves by generating symbols of himself. The recession of the American economy that began in 2009 left me – like so many others – struggling not only to earn a living, but suffering from internalized feelings of failure. I had made it through several buoyantly optimistic rounds of interviews and had come excruciatingly close to job offers. The offers had de-materialized late in the game and had left me truly struggling to discern God’s plan. As a result, I had also begun to grapple with periodic depression and low self-esteem. I had a healthy sense of realism about the particular offer I was waiting on this time, to teach high school history, but after an unusually promising day-long visit to the school, I couldn’t help but believe that I’d gotten this one. When I finally got the rejection call, I felt gutted like a fish and, after the shock wore away, I dissolved in a flood of tears. I was wound so tightly in a self-narrative of failure that all I could feel was gut-wrenching lack. To make matters worse, I had been planning a large birthday party for my closest friend all week, and I had only a couple hours to pull myself together and make a party happen. “I don’t have the inner resources to handle this tonight,” I told myself. “How can I possibly summon the joy, let alone the composure, to help host a party? What about my pain?” I arrived at my friend’s house and threw myself into chopping dinner ingredients, letting my friend and co-host handle the early guests. It became clear that there wasn’t going to be enough wine, so I trudged out the door and down the street to buy some, feeling like a true martyr. It was a late spring, Friday evening. I heard the bumping bass of bachata music coming from the house on the corner, where a large Dominican family gathered almost every Friday. Beaming old folks and posturing teenagers and bare-footed kids all danced and ate and talked at the same time. Their passion to be alive on a spring Friday evening spilled out onto the porch and wafted down the sidewalk. Though I’d passed this weekly gathering before, this time its joy felt contagious. With the comfortable weight of a bottle of cheap merlot nestled inside my backpack, I returned to my friend’s house. When we sat down to dinner, and I uncorked the wine, it suddenly became clear to me that Jesus was there. The story of the wedding feast at Cana flooded into my heart (Jn 2:1-11). At the wedding of a poor peasant couple, the wine has run out. The couple and their families are surely embarrassed. What’s a wedding without wine? Mary addresses to her son a simple plea, “They have no wine.” Her son replies, “Woman, what does that have to do with you and me? My hour has not yet come.” She tells the servants, “Do whatever he tells you.” At the wedding feast – the first of seven signs that Jesus performs in John’s gospel – Jesus transforms lack into more-than-enoughness. At the birthday party, I experienced this same transformation. In the course of dinner conversation over that uncorked and flowing bottle, I poured out my own heart. I chose to be fully present to the reality of my own suffering and, in its midst, to participate in joy by celebrating – really celebrating – the life of a beloved friend. I certainly saw Jesus in the sign given in that bottle, but I also discovered something about myself: The presence of Christ in my life did not depend upon my mood, my “successes” or my “failures.” He was holding the cup of my pain. Where before there had been only lukewarm water, I was now filled to the brim with the good wine of his Life. Cheap merlot never tasted so delicious. The whole experience unfolded as it did because that particular story from John had soaked down into my heart, and Christ stood ready to reveal a new sign by bringing that text into transformative dialogue with the ups and downs of my life. I could see it – and Jesus – and myself – in a whole new light. I could see it – and Jesus – and myself – in a whole new light. In the ninth chapter of John, Jesus singles out a man blind from birth and offers him sight. The man receives his sight – and this interaction numbers among the traditional seven “signs” in the gospel – but he also receives much more. By choosing to claim his new sight as his own in the midst of a dauntingly complex and antagonistic new world, he receives the grace of insight or illumination, a foretaste of glory. John’s blind man is given a rather specific set of instructions. Jesus “spat on the ground, made a paste with the spittle, put this over the eyes of the blind man, and said to him, ‘Go and wash in the Pool of Siloam’ (the name means ‘one who has been sent’). So he went off and washed and came back able to see.” The gift of sight for this man begins with Jesus’ direct, earthy, tactile initiation, but depends for its completion upon an act that the man himself must perform, an act with clear baptismal overtones. Then there is that subtle but startling detail: the man is sent by Jesus to Siloam, which means ‘the one who has been sent.’ In John, Jesus refers often to ‘the Father who sent me.’ The blind man acts as one sent by the Son. This synergy and even co-identification between the man and Jesus is crucial, and points to a breath-taking reality of the Johannine vision of discipleship. The disciple who persists in the hard Way of Jesus and becomes a ‘child of light’ acts as a direct emissary and representative of the Son in the same way that the Son is the direct emissary of the Father. As a light-bearer in a dark world, like Jesus, he or she will be brought into conflict with darkness, which will try to overtake the light at every turn. A key to my own relationship with Jesus in this passage has been a simple question: What was the first thing this man saw when his sight returned? And that inner Voice of prayer that speaks in my own primordial darkness, that source of my own dawning illumination, whispers to me: He saw himself. In contrast to other stories of blindness healed by Jesus, where the newly sighted open their eyes and see the face of their Healer, this man first encounters Jesus as a voice and a touch, and is sent away to wash his eyes. In a world where mirrors were rare, costly, and often crude, a calm, reflective pool of water would have been an excellent means for discerning one’s own likeness. After the ripples in the pool subside, I see this man seeing his own reflection. For the first time. As the first thing he sees. I think this event becomes the Big Bang of this man’s spiritual universe: the realization that his was a face seen and loved by Jesus in the primordial darkness and in the darkness of social alienation and unrealized personhood that had been the sum total of his life until this moment. I’d been praying with the ninth chapter of John in the second year of my novitiate when I received some unexpected advice from my spiritual director. He said, “I’d like you to spend some time each day looking at your own face in the mirror as a sign revealing God’s glory.” I had been sharing with him how the practice of simply, silently gazing on Christ’s face in love had become an intuitive impulse in my meditative prayer time. He suggested I do the same with my own face, really cultivating the recognition that Christ sees my face as a beautiful revelation of God. This was not an easy practice for me. Frankly, years of bullying and abuse by peers during my adolescence has left me with chronic low self-esteem. While today I feel confident in my own skin and deeply loved, those ancient feelings of not-enoughness and adolescent self-consciousness still come knocking now and then. Gazing at my face in this way has been a powerful, prayerful aid to seeing myself as I really am: beloved of God. The man born blind does not see Jesus as he really is until the end of the story, a moment of illumination awakened by Jesus’ question, “Do you believe in the Son of Man?” But his initiation into that journey toward beholding the face of Jesus is begun in this glimpse of himself as he really is. Perhaps he could have said, with author Annie Dillard, “I had been my whole life a bell, and never knew it until at that moment I was lifted and struck.”4 Acting from this core truth, the man is given the courage to declare of Jesus: “I do not know whether he is a sinner. I know one thing, that though I was blind, now I see.” Because he clings to that one thing that Jesus has done to him and for him by means of that life-changing sign, he knows who he is. In the same way that Jesus knows “where he has come from and where he is going” because all of his knowing proceeds from being utterly known by the Father, this man has been known by the Son. But his gaze does not stop there. Because his gaze is undeterred by every distraction and menace placed in its path, he will gaze upon Jesus in worship, the only kind of gaze which sees Jesus as he really is. You know that experience when the sunlight hits a clear windowpane in such a way that you can simultaneously see through it to the landscape beyond, as well as see your own reflection? I think of that experience as a sign. Jesus is that clear windowpane. Without the window, I couldn’t see the landscape beyond; there would be only a wall. Without the light reflected in just the right way, I couldn’t see my own reflection. As Christians, Jesus is our window onto the Beyond, displaying a clear and breath-taking view of God’s glory and training our eyes on the far horizon of eternity. But he is also our mirror, the one in whom we “behold what we are,” in whom we taste and experience our truest identity as participants in the divine nature, beloved of the Father. That light reflected in just the right way that I can perceive both visions at once is the gospel – and for me, the gospel of John in particular. The other gospels are sources of abundant Life for what they tell me about Jesus, especially the teachings by which I seek to pattern my life. John is that strange and glorious slant of light that shows me what can be told in no other way. Reading and praying with John’s gospel can allow each of us to see the ordinary, challenging, and even painful events of our lives as signs imbued with meaning. As we read the signs in the mirror and through the window, we travel a path of increasing intimacy with Jesus and clearer knowledge of ourselves. Seeing Jesus and seeing ourselves, we are gifted and graced with deepening glimpses of God’s glory. Br. 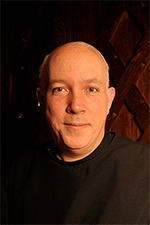 Keith Nelson came to SSJE in February of 2014 and professed his Initial Vows in July of 2016. Raised in both southern New Jersey and central Alabama and educated at Kenyon College (B.A. 2004) and Harvard Divinity School (M.T.S 2008), Keith has lived in the Boston area since 2008. For five years he was a committed member of The Crossing at St. Paul’s Cathedral as well as a parishioner at Trinity Church, Newton Center. He has worked as a high school theology and history teacher, a teacher and director of adult English classes for recent Chinese immigrants, and most recently as the parish, building, and financial administrator at Emmanuel Church, Boston. He has had a life-long passion for drawing and is an avid reader of ascetical theology, particularly fourteenth-century Middle English. He loves being a monk and a follower of Jesus.